Overwatch is finally bringing back the closest thing we have to a story mode in the form of the Overwatch Archives event. From April 10th – 30th, gamers will get to learn a little bit more about the backstories of some of the characters they’ve come to know and love. I fondly remember playing the Overwatch Uprising event last year (has it been a year already? ), when I gathered together some of my gamer friends for this PvE (Player vs Environment) mode. Set in the near future, we experienced the closest thing to being in a Terminator movie, where a group of Omnics (robots) have risen up and are decimating a section of London. We played as characters from Overwatch, an international peacekeeping force — kind of like G.I. Joe or The Avengers. In what is essentially the story mode, we’d switch off playing as the four main heroes: Reinhardt (a shield tank), Mercy (medic), Torbjorn (a builder/defense hero) and Tracer (DPS or Damage Per Second hero). As a new cadet, Uprising was Tracer’s first mission. Through the character’s dialogue and interactions during the game, and through the digital comic that was also released during the event, we got to learn some more about these heroes and how they relate to each other. Over the com-links, we also received orders from other characters higher up in the Overwatch organization: Soldier 76 who’s kind of like Captain America, Ana Amari, who is his second-in-command and Gabriel Reyes, the head of the Blackwatch covert team. Because Reyes had the cowboy McCree scout out the area ahead of time in the digital comic, my friends and I hoped that Uprising would also include a mode where you could play as members of the Blackwatch team. While Overwatch did release some sweet Blackwatch costume skins for those characters during the event last year, you couldn’t play as those characters during the story mode. You could play as them and any other hero in what was the All Heroes mode, but Blizzard didn’t add any unique dialogue or character interactions — which would have been neat. This year, we’re almost getting our wish. For this Archives event, we’re getting Overwatch Retribution and I couldn’t be more excited. Players will get to choose from members of the Blackwatch team to go on a covert mission against Talon. The Talon organization is like Cobra or Hydra. Blackwatch goes to Venice, Italy in an attempt to apprehend a top Talon agent who had a hand in blowing up an Overwatch facility in the recent digital comic. Unfortunately, things go sideways and the team has to shoot their way out. 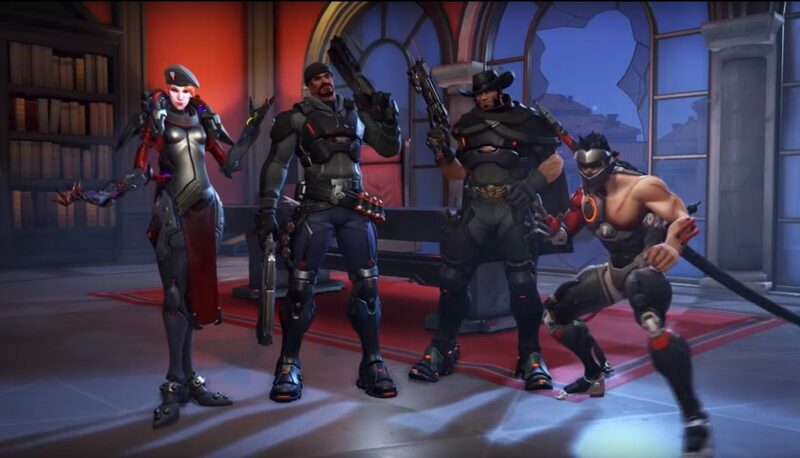 For the story mode, we’ll get to choose to play as Gabriel Reyes, who wields dual shotguns, McCree, the cowboy with a six shooter, Genji, who is a cybernetic ninja and Moira, who’s this team’s medic. Two of my friends had already been playfully bickering as to which one of them would get to play as Moira. As a recent hero to the game’s roster and a character who can sap the life-energy from her opponents to heal her teammates, she’s pretty cool. The fact that we’re getting a new costume skin for the character in this event, her Blackwatch uniform, is just icing on the cake. If you’re comparing this team’s lineup to the Uprising event of last year, you’re already seeing a problem. There’s too much DPS and no tanks or shields. When the Retribution event was first announced, I thought maybe Winston, a talking gorilla equipped with bubble shields and a tesla cannon — who’s the game’s only other real main tank — might go along for this mission. Winston and Reyes don’t get along, but Winston is friends with Genji. We see the two of them and Tracer fought to take down the villain Doomfist in the Overwatch anime short. I totally vote for more Overwatch anime shorts, by the way. I know that the regular animated shorts, beautiful as they may be, take forever to make. I really dig this anime style, however, and it would be a great way to give more backstories to the eager fanbase. Anyway, without Winston, Reinhardt or any other tank, the Retribution mission is going to be difficult… really difficult. Last year’s Uprising event was already super difficult on the hard settings, but I feel like this one is going to be nigh-impossible. We won’t be facing a bunch of robots either, we’re going to be facing trained Talon agents. In addition to their regular forces, we’re also going to have to deal with a Talon Assassin and a Talon Sniper. Without shields, we’re going to have to duck and cover a lot. Still, I’m excited for the challenge. Even if my friends and I can’t beat Retribution on its hardest mode, it will still make for a fun experience in a game that often feels stagnant between events. While e-sports and the Overwatch League might be interesting for some fans, there’s other swaths of the fanbase that longs for more lore. We want to take our heroes on story mode missions with our friends that delve into the characters’ past. Let us learn how they came to be the characters they are in the future. And have these mission events more than once a year!